Washington (CNN)– Environmental Protection Agency Administrator Scott Pruitt is very particular about the way he handles his job. Since taking the role, he’s enlisted a 24/7 security detail, he’s requested the construction of a soundproof booth in his office, and he prefers to work a three-day workweek and to meet with political allies. The people Pruitt pencils in to his daily work schedule have at least one thing in common: Most of them are Republican, according to a recently public copy of his schedule from April to early September. An overwhelming majority — 51 to be exact — of the publicly disclosed meetings and calls Pruitt’s had with government officials featured someone from the GOP. That’s 72%. Comparatively, he’s entertained only 10 meetings with Democrats. Republicans currently control the House and the Senate. Under President Barack Obama, EPA Administrator Gina McCarthy had a similar bias in her schedule for her political allies, according to a copy of her schedule as obtained by The New York Times. There’s also a possible pattern when looking at the states represented by those taking meetings and calls with Pruitt. The top states represented in meetings with the head of environmental protection are Texas, Alaska, California and Missouri. For reference, the most oil-rich states in the US are Texas, North Dakota, Alaska and California. Out of all of the federal and state government representatives that Pruitt has met with since becoming administrator, he’s talked with GOP Gov. Eric Holcomb of Indiana and Sen. Lisa Murkowski, R-Alaska, the most. On one occasion in August in Indiana, Holcomb was taking part in Pruitt’s “State Action Tour.” The topic of the discussion was rescinding and redefining the EPA’s clean water rule. The meeting was heavily criticized by environmentalist and conservation groups that were kept out. Another time, the two toured a Superfund site in Chicago. Just because he’s meeting with Republicans does not mean they are always in lock-step. Pruitt talked with Murkowski three times all in May. He met with her once at EPA headquarters, once at the White House and had a joint call with her and Sen. Dan Sullivan, R-Alaska. In June, Murkowski signaled her disapproval with a recently released EPA budget proposal, saying that it was “in direct contrast” to the climate policies of the Obama administration and adding that aid to Alaska Native villages and a radon detection program, both of which were targeted for cuts, were necessary. When Pruitt’s not in DC himself, he tends to fly to the same place — his home state of Oklahoma. In fact, according to Pruitt’s schedule, the administrator has traveled back to Oklahoma on at least seven separate trips on official business — his top destination — in the eight months since he’s been at the EPA. 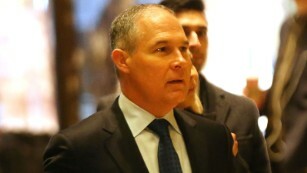 In late July, the watchdog group Environmental Integrity Project said travel records from a Freedom of Information Act request show that Pruitt spent 48 of 92 days in March, April and May traveling — including 43 days on trips that included stops in his home state of Oklahoma. EPA spokeswoman Liz Bowman said of Pruitt’s travel in a statement, “The Trump administration works to ensure all officials follow appropriate rules and regulations when traveling, including seeking commercial options at all times appropriate and feasible, to ensure the efficient use of government resources.” She declined to comment on the purpose of Pruitt’s frequent stops to Oklahoma and his preference for meeting with Republican lawmakers. Pruitt has recently been put under the magnifying glass for questionable business flights he took on private planes. The EPA confirmed to CNN that Pruitt used a private plane and military jet to travel for government duties instead of flying commercial for trips over the summer. EPA general counsel documents obtained from an EPA official confirmed that one of the times Pruitt used a charter plane was during a July 27 trip he took on a Department of Interior jet from Tulsa, Oklahoma, to Guymon, Oklahoma. The document showed Pruitt took the same aircraft from Guymon to Oklahoma City. The fact that Pruitt travels so much seems to be represented in the fact that he holds most of his meetings three days of the week: Tuesday, Wednesday and Thursday. Wednesday is his busiest day; he’s held 97 meetings on hump day in that time period, compared to almost half that on Monday, with 59 meetings, and Friday, with 53.